We recently received the NUS Silver Green Impact Award for Sustainability! The award was presented to some members of our sustainability team during a ceremony that took place in Bush House, Kings College London. 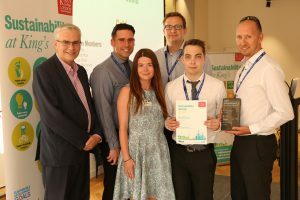 The NUS Sustainability audit was very positive and the Team in London were really impressed with what we are doing down here in Cornwall to become a more sustainable work place. With an active sustainability committee engaging with and hosting events, such as The ‘Love Your Neighbourhood’ event, which was a real success and provided some fantastic evidence of the type of impact we are having. What’s even more encouraging is that some of the work we have already put in will count towards the Gold Award criteria which is something we are already working on. A good example of this, is that we will soon have litter pickers and bag hoops available for everyone to use when we go on our lunchtime walks around the block! A big thank you to everyone for helping King’s Service Centre achieve the NUS Silver Award. We are now going to push on and go for Gold in 2019! Want to get involved locally? The next local event on the calendar is on the 29th September, where we will be supporting the Fistral Beach Clean.